From Granville Island Brewing out of Vancouver comes their new “Maple Shack Cream Ale” the last in their new Under the Bridge Series. Like all of their small bottle beers this one is produced by their parent company. The beer pours a deep amber colour with a tan head. The aroma consists of malts, toffee and maybe some maple. The flavour is of malts, caramel, earth, maple with little to no hops bitterness. The alcohol content comes in at 5% with an IBU of 19. This beer is by no means ground breaking but for an entry level craft beer its well worth a pick up. 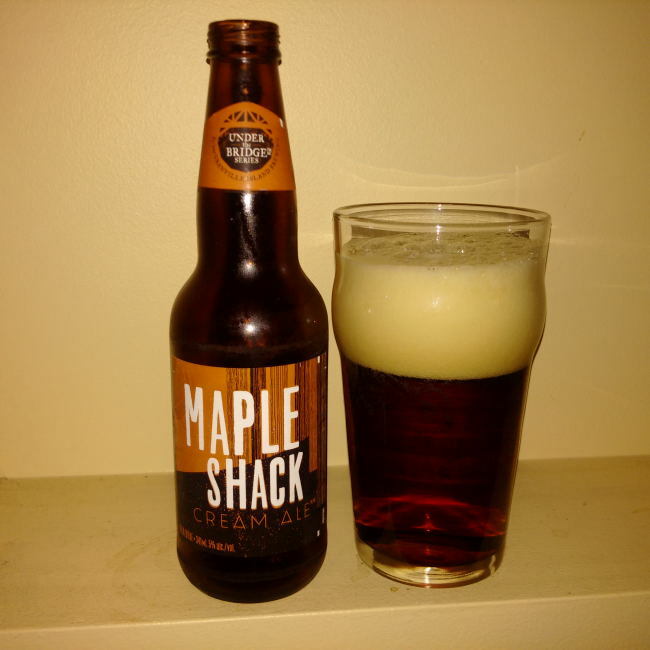 Commercial Description: This malty, smooth maple cream ale has a hint of maple syrup, with a mild hop bitterness. It’s a tribute to both Quebec’s legendary sugar shacks, and the tin roofs that littered this island back in the day. Big saps welcome. Get Under the Bridge. Food pairing as per brewery: It’s roasted. Caramel malt flavours go well with all kinds of roasted meat flavours. Perfect pairings: Roast beef or BBQ ribs. This entry was posted in Cream Ale and tagged caramel, cream ale, earth, granville island, granville island brewing, low hops, malt, malts, malty, maple, maple cream ale, maple shack cream ale, under the bridge series, vancouver.